Speculation regarding the reasons behind the abrupt resignation of Deputy Prime Minister Vladislav Surkov, the onetime gray cardinal of the Kremlin and a powerful government official, continued to swirl over the Victory Day holiday weekend, with most politicians and observers calling it a major blow to the embattled Cabinet of Prime Minister Dmitry Medvedev. The Kremlin portrayed the ouster of Surkov, who had recently become embroiled in a verbal conflict with federal investigators over a corruption case involving the Skolkovo innovation hub, one of Surkov's pet projects, as the first casualty in a drive to ensure that Cabinet ministers fulfill Putin's orders. Skolkovo has also been a prized initiative of Medvedev, and some observers said the prime minister was the real person being targeted with the resignation and recent attacks on the Cabinet. A terse Kremlin statement announcing Surkov's departure said it was voluntary, but there were indications that he had come under serious pressure to leave his post. 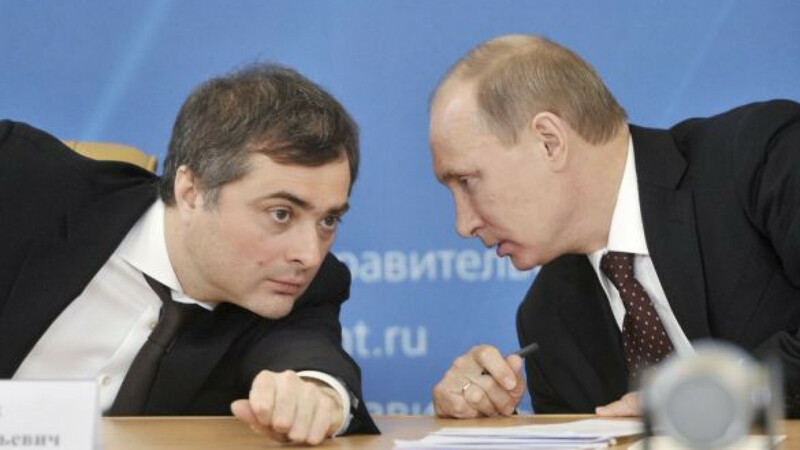 "In accordance with paragraph D of Article 83 of the Russian Constitution, Vladislav Yuryevich Surkov has been released from the office of deputy prime minister at his own request," the Kremlin said in the statement. Paragraph D gives the president the right to hire and fire deputy prime ministers on the recommendation of the prime minister. Putin's spokesman, Dmitry Peskov, said Surkov wrote a letter of resignation in connection with orders that the president had given the Cabinet to fulfill when it was first appointed last May, RIA-Novosti reported. "The president's decision to sign the document was linked to the implementation of presidential decrees in May and election promises and the work of a White House commission that deals with the implementation of these orders," Peskov said. Putin sharply criticized members of the Cabinet at a meeting a day before Surkov's resignation for failing to properly implement his orders, to which Surkov responded that the government's work was adequate. But Surkov told reporters on Wednesday that he wrote his letter of resignation on April 26, adding that he would discuss the reasons behind it at a later time, “when it will be appropriate.” Prime Minister Dmitry Medvedev's spokeswoman Natalya Timakova confirmed that the request to leave his post had been written in April and told Forbes that Medvedev was aware of Surkov's decision. On Thursday, Medvedev appointed Surkov's first deputy, Sergei Prikhodko, 56 — who took over responsibility for Russia's external economic activity in the government last June — as acting deputy prime minister. A Kremlin-connected friend of Surkov indicated that the former deputy prime minister had little interest in remaining in the government, as his influence had waned, and that he quit because his advice was no longer being heeded. "He created a system that was approved by many people in Russia. But he also was a man who saw cracks in this system, and he wanted to upgrade it, bringing new players into the game," the friend said, speaking on condition of anonymity so as to not damage her relationship with Surkov. "However, he wasn't heard, so he washed his hands of the matter." “Deputy prime minister and head of a government office is a very responsible post — it's systemic work — while Surkov has a different mentality. He is a creative intriguer, so to speak,” Kasyanov said. Surkov, who is credited for playing a key role in developing Putin's political system as a longtime Kremlin deputy chief of staff, grabbed headlines over the May 1 holidays when he criticized the Investigative Committee for alleged violations in its politically tinged inquiry into embezzlement at Skolkovo, Russia's answer to California's Silicon Valley. Investigative Committee spokesman Vladimir Markin on the eve of Surkov's resignation published a newspaper column that suggested such criticism was inappropriate. Investigators are looking into whether Skolkovo vice president Alexei Beltyukov embezzled $750,000 and gave the money to opposition-minded State Duma Deputy Ilya Ponomaryov. On Tuesday, Beltyukov was placed on leave of absence, and Ponomaryov was questioned by investigators. Putin's spokesman on Wednesday denied any link between Skolkovo and Surkov's exit, but most observers were outraged by Markin's remarks in his newspaper column, saying a PR person could not criticize such a high-ranking official without the Kremlin's approval. “It's clear that the Kremlin agreed to it, because it's very unlikely such a minor official could do that at his own initiative, or even at the initiative of his boss,” Alexei Makarkin, deputy head of the Center for Political Technologies, told Business-FM radio. Forbes Russia, citing unidentified government officials, said Surkov might have defended Skolkovo's reputation because he was directly involved in the embezzlement, alleging that he gave money to Ponomaryov because he supported his opposition activity. An unidentified official told Forbes that Beltyukov testified that Surkov had approved the transfer of money to Ponomaryov. Ponomaryov told Forbes that he did not know anything about Surkov's involvement in giving him money, which he said he received for giving lectures at Skolkovo and for writing an academic paper. He added that Surkov did not participate in the daily work of Skolkovo but was only its curator in the government, overseeing its overall development. An unidentified official, however, told Forbes that the Kremlin suspected Surkov of financing not only Ponomaryov but other opposition figures as well, including Duma Deputy Dmitry Gudkov and his father Gennady, ousted from the Duma last fall. The officials also said the resignation was not sudden, noting that pressure on Surkov began to mount back in February, when investigators and the Audit Chamber began citing violations at Skolkovo. Ponomaryov on Wednesday called Surkov's departure a "most serious blow" to Medvedev's Cabinet. "Surkov's resignation is a most serious blow to Medvedev's government. I don't know whether it was initiated by Putin or Surkov himself, but he was a key figure in Medvedev's Cabinet," he wrote on Twitter. Political expert Dmitry Oreshkin told Kommersant FM radio that Surkov's resignation showed that Putin had directly intervened in Medvedev's Cabinet and predicted that Medvedev probably also faced dismissal. Many observers agreed that Medvedev was the main person being targeted. Some even alleged that Surkov's supposed conflict with Markin was a red herring, used to create the impression that the main reason for his resignation was a disagreement with law enforcement officials and their Kremlin supporters. Itar-Tass, citing an unidentified Cabinet official, said there were no plans to offer Surkov a new post in the government. He may face a promising future back in the private sector, however. He spearheaded advertising and public relations for jailed tycoon Mikhail Khodorkovsky from 1991 to 1996 and worked for Rosprom, Alfa Bank and Channel One television before Putin appointed him as a Kremlin aide and later deputy chief of staff in 2004. He was appointed deputy prime minister when Putin returned to the Kremlin for a third term last May.